Mighty Car Mods is one of the best do-it-yourself tuner channels on YouTube, having built a collection of lovable misfits that includes a Daihatsu Mira and an LS-powered Mad Max-style car. 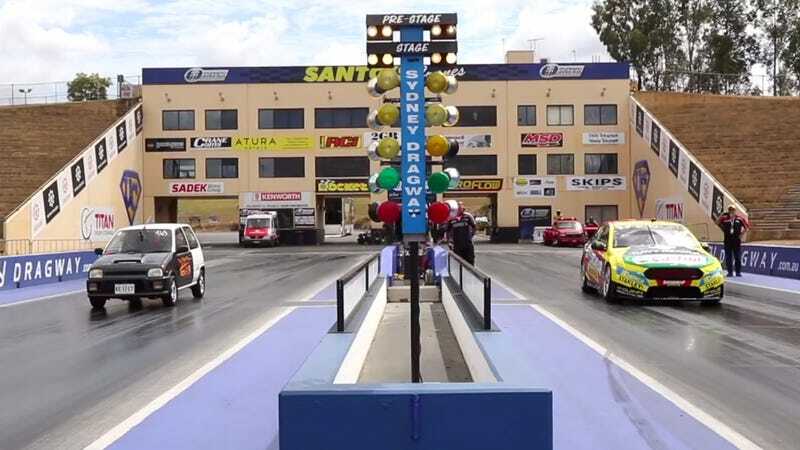 Clearly, there’s no better way to test their work than by drag racing their cars against an Australian V8 Supercar that produces over 600 horsepower in race trim. To do this, Mighty Car Mods enlisted the help of 2014 Bathurst 1000 winner Chaz Mostert and his Tickford Racing Ford Falcon Supercar. It’s one of the last V8-powered supercars, with a 5.0-liter Ford V8 that runs on E85 fuel. Mostert (somewhat accurately) describes MCM’s budget builds as “absolute shitboxes,” but also admits he doesn’t have any drag racing experience—only standing starts in V8 Supercars. This is probably the only time you’ll ever see a Daihatsu Mira kei car line up against a professionally built V8 Supercar, where even the MCM crew seems starstruck at what they’re about to do. 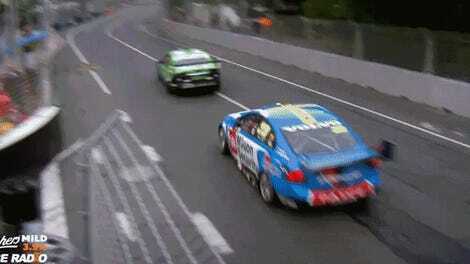 And let’s be honest—is there anything more Australian than a V8 Supercar vs. Mad Max build drag race? Mostert’s Tinder-browsing tendencies gives the MCM team a bit of a head start for their slower cars, but the later runs are more head-to-head. The crew breaks one car in the process, but when you break your car racing a Bathurst winner, is it really that bad of a day? It’s not all bad, though. I won’t give off the ending, but it includes a big, fat burnout. 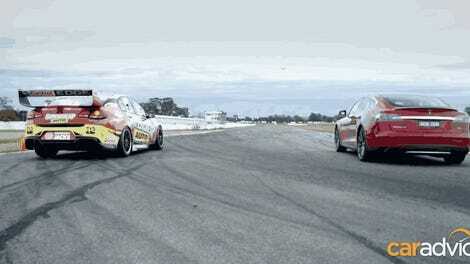 Can A Tesla Model S Beat An Australian V8 Supercar In A Drag Race?